I found this picture up on Minxy's wall the other day and after hearing me giggle she asked what was funny. 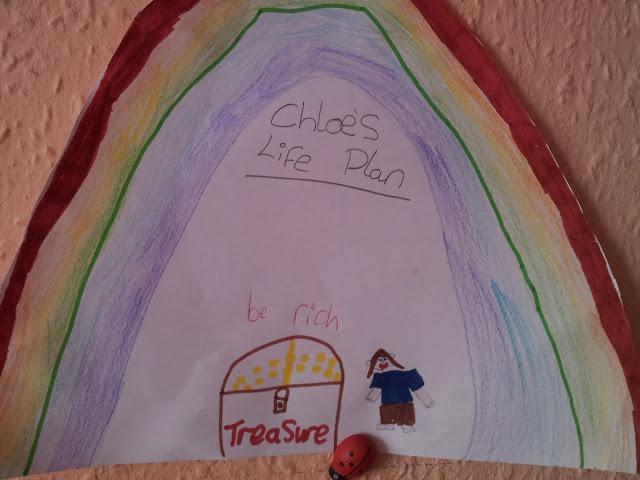 She did explain that although she plans to find gold at the end of the rainbow she still wants to be a vet and have a job, but I loved the idea of finding treasure being a life plan. Children have such wonderful dreams and imaginations, no worry or stress and I wish as adults life was as easy! Maybe a lotto win will sort us all out for life instead. Don't knock it - that's still my life plan and I am 37! Hahaha amazing! The drawing and the plan...Maybe I should not say this but I am still counting on finding it one day! Was this a school task or did she decide to just come up with a life plan herself? Girl clearly has her head screwed on right! Brilliant plan! !